As much as young couples preparing for marriage are already experiencing the jitters and the butterflies that come with uncharted territories, I often choose to aggravate their anxiety by issuing one last caution – “Be warned before you enter! Marriage is dangerous. So dangerous it can get you killed!” I don’t think that this is an exaggeration. It’s stating the truth, the hard truth about marriage. These couples are entering into something which only death can release. “What God has united, man must not divide.” Only God can divide and He does so through death. 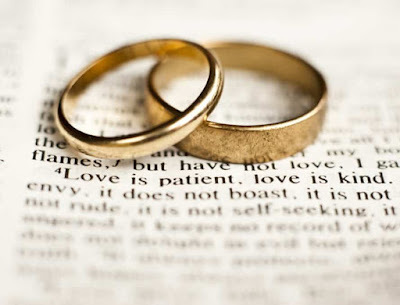 No wonder one traditional translation of the wedding oaths entails life-long fidelity “till death do us part.” As much as the world often mocks the Church’s teaching on the permanence of marriage, that marriage is a permanent commitment that can only be dissolved by death, the Church can do no more than teach what Christ has taught us from the beginning. So what exactly is Christ’s teaching on marriage and divorce? As difficult or as disagreeable as this may sound, Jesus did not mince His words when He described the action of divorcing one’s wife and remarrying another as “adultery.” In the gospel that we’ve just heard today, Jesus does the unimaginable. Many modern Christians would have imagined Him coming to relax the Law. We argue that it’s only human to fail: We live in an imperfect world made up of imperfect folks who often make imperfect promises. One would imagine our Lord agreeing with this and mercifully bending His teachings to match our predicament. But instead, He proceeded to raise it. The bar would no longer be set at a level that corresponds to human imperfections and limitations but rather it would be pegged to the standard of perfect love which the Lord had for His people. And how did He love them? He loved them to the end. God and not sin, would now be the new benchmark for all human relations. From the moment of man’s creation, God has remained faithful. Covenant is the key word to describe this relationship. God didn’t make a contract with us; God made a covenant with us. The covenant called the parties to mutual faithfulness, a faithfulness that is neither tentative nor conditional. There is no “break clause” in this covenant. But was it a happy marriage? Hardly. In fact, the whole salvation history is a story of man’s unfaithfulness matched by God’s faithfulness. God could have broken His end of the deal in the face of wanton breaches on our part. But He didn’t. God could have chosen to “divorce” His people. But He didn’t. Instead, God chose the way of love and forgiveness. This is the way of fidelity. To put it another way, He chose death over breaking His covenant with us. He staked His entire life on this covenantal relationship. He chose to stick with us in good times as well as in bad times, in sickness and in health, “till death do us part.” But even death could not separate us from His love. His unconditional love for us is therefore the foundation and the standard by which marital fidelity is to be built. Thus, we have the reason for the Church to defend its teachings on the permanence of marriage and the reason why Jesus spoke so harshly of divorce and attempted remarriage. Perhaps, the world finds such an arrangement harsh and untenable. It does so because it seems that everything in this world is marked by a certain tentativeness, that’s why there is the inclusion of a break clause in most contracts to allow the parties to mutually exit the partnership when things turn sour. But the Catholic Church sees it differently. She takes a Catholic at his word when he makes his vows, freely and knowingly, at his wedding. The Church must likewise call him to lifelong faithfulness to that vow, for the marriage vows bring into existence a permanent union that is joined together by God. It is “God” who joins man and woman together,” and therefore only God who can put them asunder. The reason why the Church objects to divorce and would not allow a “second” marriage, is because the Church does not presume that it has the authority to erase the tape on someone’s marital history, and then pretend to take him at his word when he makes his wedding vows a second time. Marriage is either what Christ taught us it is, or it means whatever you want it to mean. Thus, the Church is not just being preachy and unreasonable when she tells you how serious she is about marriage. So serious that so many within the Church were willing and are willing to stake their lives on it. We do not only have the testimony of words but also the testimony of martyrs. They were willing to die not just for an idea or to defend an institution. They were willing to go to their deaths precisely because they were dying for the gospel, for Christ Himself. There is no better place to witness this than in England. What caused the Church in England to break away from the Catholic Church to form the Church of England was this very issue of divorce and remarriage. All the country’s bishops, with the exception of Bishop John Fisher of Rochester, supported Henry VIII’s attempt to undo his first – and legitimate – marriage. Like Fisher, St Thomas More a layman and the king’s chancellor, also withheld his support. Both were martyred for defending the institution of marriage. In a world that thrives on impermanence, where relationships are often abandoned and exchanged for new substitutes, just like the way we deal with our electronic gadgets and devices, we need to ask this question: Did Thomas More and John Fisher sacrifice their lives in vain? Were they mistaken? Could they be accused of being overly rigid in their interpretation of the law and sadly un-pastoral? One may argue that these saints lived in a very different age, with very distinct values and ideas. But have things really changed to warrant a change in the law or pastoral practice? Very much against the flow, St Thomas More and John Fisher and many more Catholics chose a path, a way of life which was going to bring them into collision with not only social mores, family and friends, but also with the highest authority in the land. They chose to die defending their faith. They chose to die defending the institution of marriage. On all these things they were prepared to stake their lives, literally, for they were things they could die for! So deep was their conviction, their faith in this that nothing could turn them away from the course they had taken, neither death nor life, no angel, no principalities, nothing that exists, nothing still to come, not any power, or height or depth, nor any created thing. It perhaps seems strange to us today that someone should even consider giving his life for such theoretical, theological niceties. The arguments of our age turn around the fulcrum of whether or not, anything can be of such value and certainty that we should give our lives for it. Yet, again, while this argument rages, many Christians continue to give up their lives rather than to turn their backs on their faith. Can you drink the cup that I must drink?